At Children of America®, our employees are the fuel that helps our company run. We are committed to making you feel important and part of a team. You will have the chance to work in a fun environment that encourages career growth, promotes from within and recognizes the part the each and every employee plays in making our company great. Each month, three teachers are selected for their outstanding performance, enthusiasm and customer experience, recognized as “Teacher of the Month” and awarded a certificate and monetary recompense. Our yearly recognition program recognizes, our biggest achievers in leadership, big-picture thinking, performance and uncompromising dedication as Director of the Year, Campus of the Year, Teacher of the Year and Executive of the Year, and are presented with our “Bentley” award and bonus. Each year we celebrate our teachers with a week of activities and prizes. We celebrate them in May coinciding with Mother's Day and honor their hard work with keepsakes and lunch on us. Certain milestones are honored at COA. 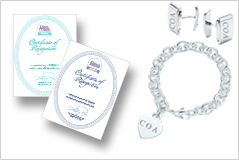 At the five-year milestone, employees receive an engraved Tiffany bracelet (female) or cuff-links (male) and a certificate acknowledging their contribution to the company. 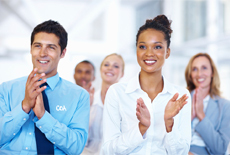 When the ten-year milestone is reached, employees earn a $500 or American Express gift card. We know the day-to-day lives of teachers are full. So one day every quarter we feed the body and soul of our staff with an eat-in lunch - Food for the soul and a break for all. Developing leaders and encouraging company advancement is vital to our operating philosophy. COA creates and implements training and development programs eligible for CEUs as the company is an authorized provider for IACET. We offer a Mentor Teacher and Associate Administrator program dedicated to the advancement of our internal staff. For details speak to your Human Resource specialist.